2. Quit smoking and reduce your alcohol intake as a sure way to help your liver synthesize and process all lipids correctly. 3. Bump up your fiber intake as an excellent way to reduce triglycerides. Eat more beans, lentils, and oats to reduce your body’s natural absorption of low density lipoproteins from foods. 4. Supplement your diet for high triglycerides with high quality sources for Omega3 fatty acids like cod liver or krill oil, make sure these supplements come from a reputable sources and do not contain any mercury traces. 5. 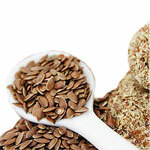 Introducing flaxseed oil or meal into your diet will be a great way to get more plant-based Omega3 fatty acids to keep your levels of good cholesterol high. 6. Niacin (vitamin B3), red yeast rice extract are the best natural remedies to help you reduce triglycerides. 7. Reishi mushroom is a potent way to keep your heart healthy by maintaining proper level of lipids in blood and regulating coronary blood flow. 8. Keep your saturated fat level intake under 10% mark but do not entirely cut them out as by doing so you will trigger your liver to produce even higher levels of bad cholesterol to compensate for the shortage. Our bodies need some saturated fats for cell membrane formation and proper hormone function. 9. Lowering your overall daily calories intake will help you lose weigh and reduce triglycerides in your blood to ward off heart disease. 10. Sedentary lifestyle greatly contributes to your causes of high triglycerides, involve in a moderate exercise at least 2-3 times a week for an hour as the best way to reduce triglycerides. While some causes of high triglycerides are genetic in nature, there’s still a lot we can do naturally to help with elevated triglycerides levels.